Masonry system 6 is a rainscreen wall system with concrete masonry unit (CMU) structure and adhered veneer over a cement backer board substrate. The adhered masonry veneer may be thin brick, natural stone, or manufactured stone. 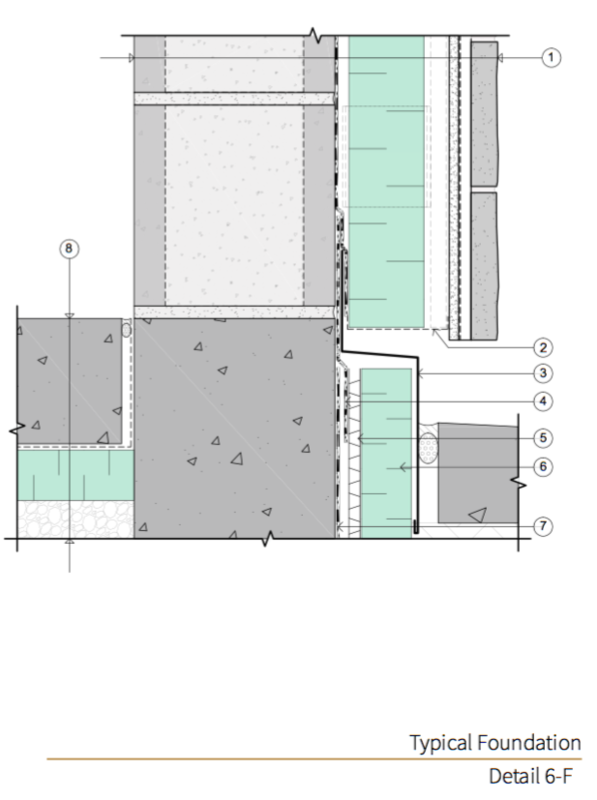 The components of this system, from interior to exterior, are described in Fig. 6-1. This system is appropriate for many applications including low- or mid-rise residential or commercial buildings. An example application of this system is shown in Fig. 6-2 on page 6-2. Fig. 6-1 Typical System 6 components from interior to exterior. Fig. 6-3 illustrates the water- shedding surface and control layer locations for this system. The water-shedding surface and control layers are also shown on typical system details provided adjacent to each detail at the end of this chapter. As shown in Fig. 6-3, the water-shedding surface occurs at face of the adhered masonry veneer, with most water shedding occurring at the wall while some water may be stored within the masonry veneer to be released later. The water control layer, the air control layer, location at the exterior face of the CMU wall structure. The thermal control layer within this system occurs at the exterior insulation. 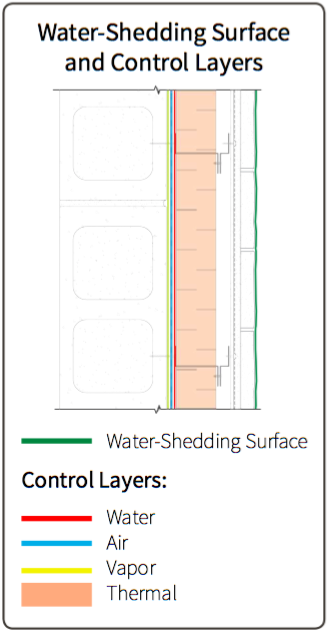 The adhered veneer cladding—including both grout joints and veneer units—is the primary water-shedding surface of the wall system. 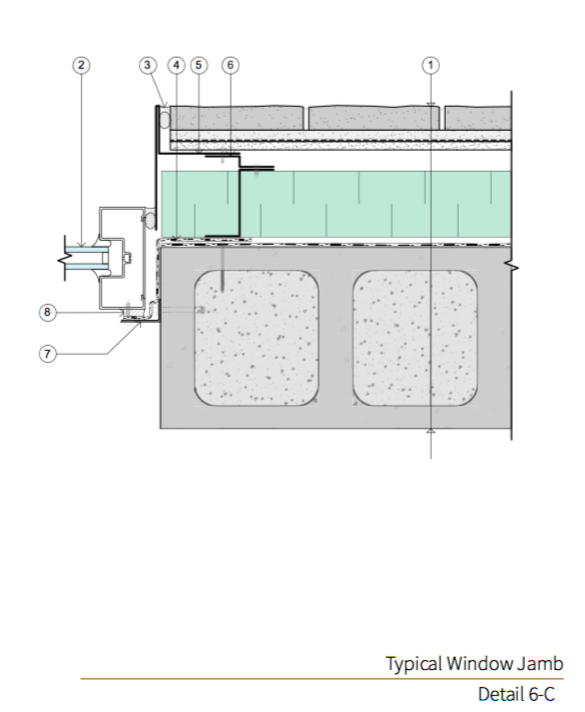 Additional water-shedding surface components within the wall system include sheet-metal flashings and drip edges, sealant joints, and fenestration systems as shown on the details included at the end of this chapter. To promote water shedding at the cladding, grout joints between veneer units should be installed with a tooled concave (preferred) or “V” shape. The water-shedding surface is most effective when free of gaps other than those providing drainage and/or ventilation. Movement joints and joints around fenestrations and penetrations are recommended to be continuously sealed with backer rod and sealant or counterflashed with a sheet-metal flashing to deflect wind-driven rain and shed water away from the rainscreen cavity. In this wall system, the WRB system is typically a self-adhered sheet or fluid-applied system that also functions as the air barrier system; thus, the WRB system is o en referred to as the air barrier and WRB system. Either a self-adhered sheet or fluid-applied system is depicted in the details at the end of this chapter. An example of a fluid-applied air barrier and WRB membrane is shown in Fig. 6-4 on page 6-4. This membrane may have Class I, Class II, Class III, or Class IV vapor permeance properties because it is located interior of the system’s thermal insulation. Physical properties of the WRB system products are discussed in detail in the Water Control Layer discussion on page i-24. Vapor permeability of materials is addressed in the Vapor Control Layer discussion on page i-28. The WRB system must be continuous across the wall system to provide effective water control. In addition to the field membrane, the WRB system includes fluid- applied or self-adhered flashing membranes, sealants, sheet-metal flashings, and penetrations such as windows and doors as shown in the detail drawings that follow this chapter discussion. Where sheet-metal flashing components occur within the system, the back leg of the sheet-metal flashing is shingle-lapped into the WRB system to facilitate drainage at the face of the WRB system and to the exterior of the cladding. The air barrier system serves to provide the air control layer. In addition to controlling air, this layer also assists with controlling liquid water, heat, and water vapor. For this wall system, the air barrier system is the same field membrane and components that also serve as the WRB system. A general discussion of the air control layer and the air barrier system is provided in the Air Control Layer discussion on page i-26. As discussed in the introductory chapter, the air barrier system must be continuous and fully sealed to resist air flow, whereas the WRB system is not required to be continuously sealed to be effective. Note that Fig. 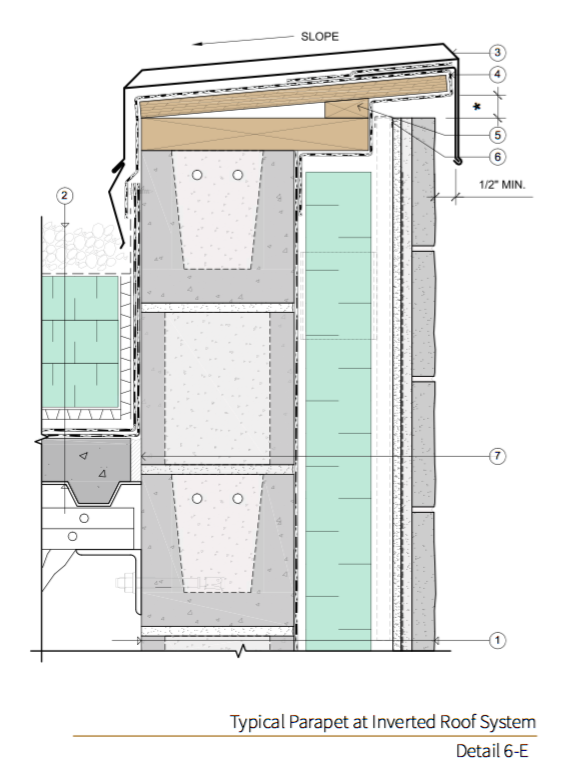 6-3 on page 6-3 identifies the vapor control layer at the exterior face of the CMU wall. This represents the exterior-most plane of the CMU wall structure, which has some vapor resistance. It would also represent the location of a vapor control layer if a relatively low vapor permeance (Class I or II) air barrier and WRB system were used. In this wall system, the exterior insulation is the primary material that forms the thermal control layer. At transition details, the thermal control layer extends to the exterior insulation across bond beams, peripheral floor lines, and insulation at the roof assembly, slab, and foundation elements. Windows and doors that penetrate this system are also part of the thermal control layer. Keeps the structure warm, which reduces the risk of condensation developing inboard of the WRB system. Protects the air barrier and WRB systems both from extreme temperature cycles and from damage during veneer installation. The CMU in this system is also a thermal mass; thus, it may provide thermal mass benefits. 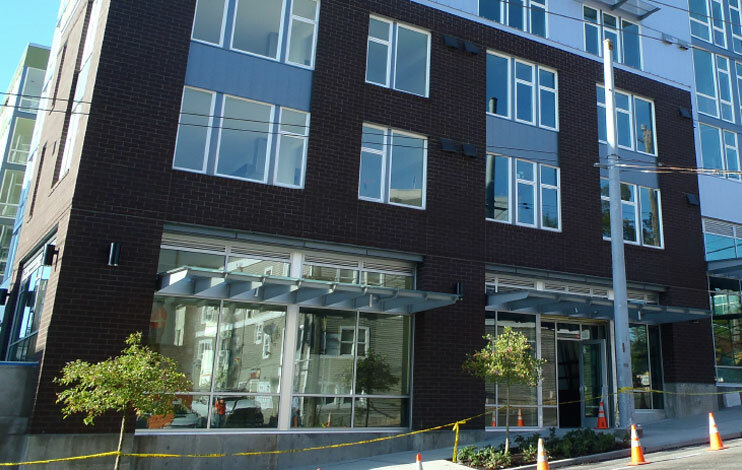 In the Northwest region, the exterior insulation for this system is typically semi- rigid mineral fiber board insulation; moisture-tolerant rigid board insulation products (e.g., polyisocyanurate or XPS) may also be used. Refer to the Insulation Products discussion on page i-30 for information on various insulation types as well as additional considerations. Fig. 6-3 System 6 water shedding surface and control layer locations. 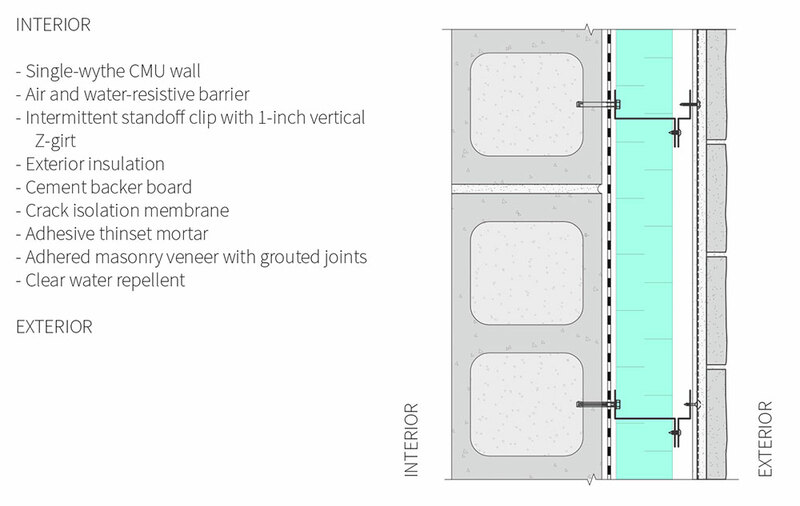 A mechanically attached air barrier and WRB system may be used for this wall system where recommended by the manufacturer for installation over a CMU wall substrate. Although masonry is defined as a noncombustible cladding material, the use of a combustible air barrier and WRB system or foam plastic insulation within a wall cavity can trigger fire propagation considerations and requirements. Depending on the local jurisdiction, IBC Section 1403.51 (regarding vertical and lateral flame propagation as it relates to a combustible WRB system) may require acceptance criteria for NFPA 2852. The use of foam plastic insulation within a wall cavity should also be addressed for IBC Chapter 26 provisions. Adhered masonry veneer with grouted joints typically sheds most water it is exposed to; however, some moisture is expected to penetrate the cladding and enter the rainscreen cavity. This moisture is drained through the air cavity (created by the continuous Z-girts that support the cladding) or through the drainable semi-rigid insulation (where used). The air cavity of this system is created by continuous Z-girts, o en 3/4-inch or 1-inch minimum depth, spaced at 16-inches on- center or as needed to accommodate movement joints. These continuous Z-girts are broken at horizontal joints where movement is expect to occur or at cross- cavity sheet-metal flashings. In the Northwest region, the air cavity is typically open at the top and bottom to encourage ventilation. Where the air cavity is open, (e.g., base of walls, window head flashings, parapets, and cross-cavity flashings at floor lines), it is recommended that the cavity is screened to allow for ventilation to occur while still protecting the cavity from insects. Sheet-metal components for this system are reflected throughout the details located at the end of this chapter. 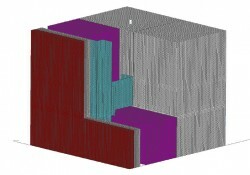 Cross-cavity sheet- metal components are located at the head of wall penetrations (e.g., a window head) and at cross-cavity flashing locations similar to that shown in Fig. 6-10 on page 6-12. These flashings help drain the rainscreen cavity and protect any air barrier and WRB system components behind them. Counterflashing sheet-metal components assist with water shedding and are typically located at windowsill and parapet top conditions; they protect the cavity from water ingress while allowing ventilation of the air cavity. Sheet-metal flashing components that penetrate the exterior insulation act as a thermal bridge and degrade the thermal performance of the system; however, they are a necessary element for rainscreen wall system performance. In this system, the masonry units are bonded to a crack isolation membrane over a cement backer board substrate. If using clay masonry units, they will expand over time, whereas concrete-based veneer products and grout joints between units will shrink. Minor movement is expected within the cement backer board and non-metal or intermittent metal cladding support clips; however, Z-furring may experience some movement due to temperature changes. The CMU backup wall structure of this system is expected to shrink over time due to initial drying, temperature fluctuations, and carbonation. As a result, both horizontal and vertical movement joints are needed to accommodate differential movement between the structure, cladding support system, and veneer components to prevent damage to the veneer or other wall components. Horizontal gaps within the veneer and cladding support system typically occur at cross-cavity sheet-metal flashing locations that coincide with building floor lines, a common location for building movement. These gaps are typically provided at, and should be continuous across, all elevations of the building. Also recommended are gaps above and below through-wall penetrations (e.g., windows and those described in the Masonry Veneer Penetrations discussion on page i-54), below structure projections (such as parapet blocking), and where needed to minimize veneer panel sizes. At each horizontal gap, there is typically either a compressible backer rod and sealant joint or a cross-cavity sheet-metal flashing. The sizing and location of these joints will vary depending on the expected differential movement between the wall and veneer. The location of vertical joints varies throughout the industry and should be confirmed with the veneer unit manufacturer for the project-specific application. This guide recommends locating vertical movement joints throughout the veneer system and considering horizontal-to- vertical placement relationships. Refer to the Movement Joints discussion on page i-48 for more information on locating both horizontal and vertical veneer joints and for sealant joint best practices. Adhered veneers rely on adhesion to secure the masonry units and should be designed to comply with local building codes and TMS 402-16.6 The adhered veneer should be designed by the Designer of Record and—as described by TMS 402-166 commentary—should consider the adhesion of the veneer units, the curvature of the veneer backing, freeze-thaw cycling, water penetration, and air and vapor transmission when necessary. The code requires that adhered veneers be applied over concrete or masonry backings and, traditionally, adhered veneer was applied directly over these wall types. However, recent code cycles requiring exterior insulation have dictated that adhered veneers over a CMU wall include some insulation that may occur at the exterior face of the backup wall and WRB system plane. Per TMS 402-16,6 adhesion between the adhered veneer units and the backer must have a minimum shear strength of 50 psi in accordance with ASTM C482;7 however, significantly higher bond strengths can be achieved with currently available products and may be appropriate for projects within the Northwest region. 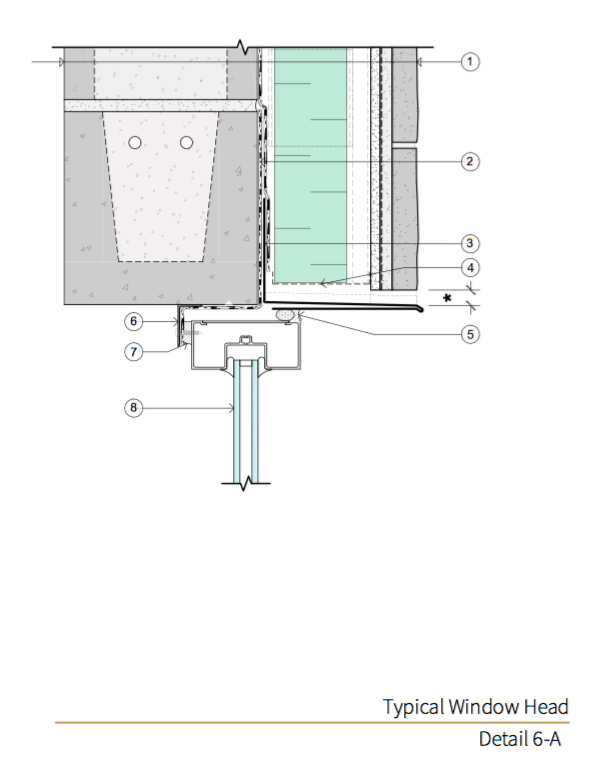 Adhered veneer units for this system are adhered in a thinset mortar to form a continuous bed that is free of voids. It is best practice to adhere the veneer units of this system with a polymer-modified mortar over a crack isolation membrane and water-resistive cement backer board. 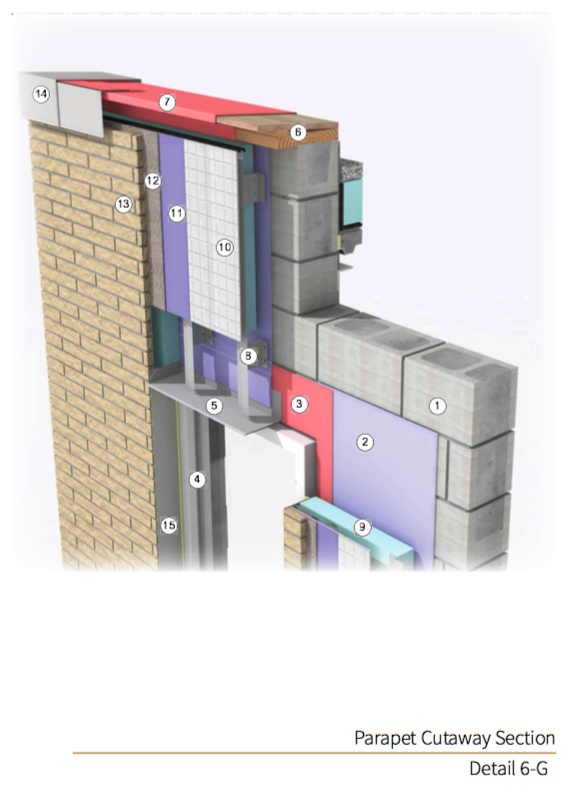 When exterior insulation is required, the masonry veneer is supported by intermittent cladding support clips and continuous vertical Z-girts such as those shown in Fig. 6-11. The spacing of the clips and the sizing of the girts are designed by the Designer of Record to resist building loads and limit out-of-plane deflection of the wall to reduce the likelihood of flexural cracking. 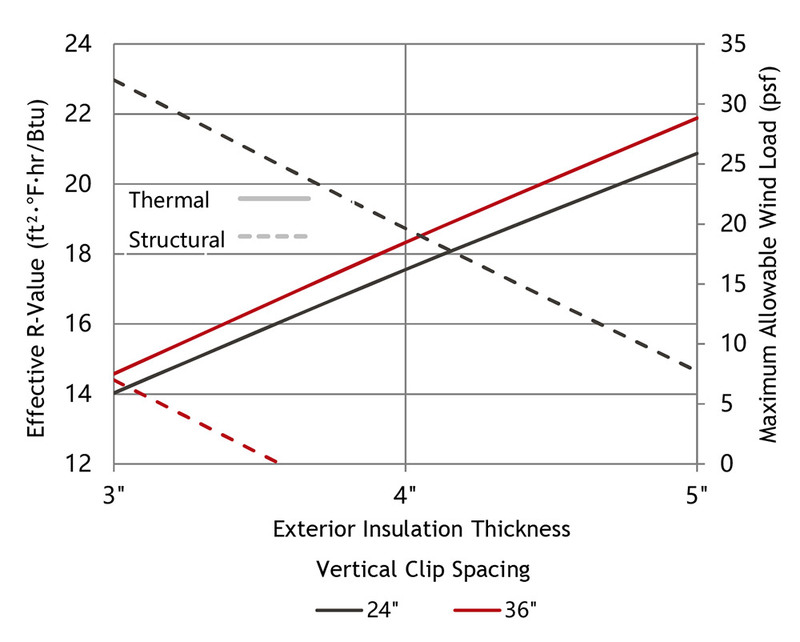 Minimizing the cladding support clip spacing may be considered to limit out-of-plane deflection but can impact the effective thermal performance of the system. As shown in Fig. 6-12, smaller cladding support clip spacing is necessary to resist greater wind loads. As clip spacing is reduced, the effective thermal performance of the system is also reduced. Using lower-conductivity clips can reduce the impact that cladding support clips have on the thermal performance. It is best practice to match the durability and longevity of metal components within this system to that expected of the masonry veneer. Metal components within this system include intermittent Z-girts (when constructed of metal), continuous Z-furring, sheet-metal flashings, and fasteners such as screws and anchors. Where available, sheet-metal components supporting the veneer or acting as sheet-metal flashings should be AISI Type 304 or 316 stainless steel per ASTM A666,8 which is nonstaining, resistant to the alkaline content of mortar materials, and tolerant of the humidity conditions that can exist within the air cavity. Where stainless-steel components may not be available or economically feasible, G90 or G185 hot-dipped galvanized- steel products per ASTM A6539 or minimum AZ50 or AZ55 galvalume- coated sheet steel in conformance with ASTM A79210 may be used but should be carefully considered based on the project’s exposure and expected longevity. Coating the exposed top finish of any sheet metal with an architectural-grade coating conforming to AAMA 62111 is recommended. Fasteners used with metal components should be corrosion- resistant, either hot-dipped galvanized steel or stainless steel to match adjacent metal components. Fig. 6-12 System e ective R-value as it compares to maximum-allowable wind loads for various fiberglass stando clip spacings. These results assume fiberglass stando clips with two stainless-steel screws spaced at 3-inches vertically and attached into a CMU wall substrate. The clips resist vertical gravity loads equally and receive horizontal loads based on their tributary areas. The design is generally limited by the pull-out resistance of the upper screw through the clip, which is under tension from the weight of the cladding and from horizontal wind suction pressures. The allowable screw loads are based on testing data and are specific to the type of screw modeled. The allowable wind pressure should always be compared to the specified wind pressure acting on the cladding, as determined by the local building code in the applicable jurisdiction. These structural values provide a schematic relationship between thermal and structural performance and are not intended to be used as structural design values. In the structural design graphs, the cladding weight was set at 20 psf. The horizontal clip spacing remained at 16-inches on-center. The clip vertical spacing options are 24- and 36-inches and the exterior insulation thickness ranges from 3- to 5-inches. Cement backer board used within this system is exterior-grade water-, mold-, and mildew-resistant, which meets ASTM C132512 Type A (exterior applications) or ANSI 118.9.13 The cement backer board is attached to the continuous vertical Z-girts as required by the backer board manufacturer and project-specific design loads. The attachment method used should be appropriate for the Z-furring and intermittent cladding support design. Joints of the cement board are typically staggered and treated with a mesh tape bed in the thinset mortar. Cement backer board product should be installed in conformance with the manufacturer installation instructions. The cement backer board should not span joints within the veneer that are expected to accommodate movement similar to that shown in Detail 6-D.
Reducing efflorescence. 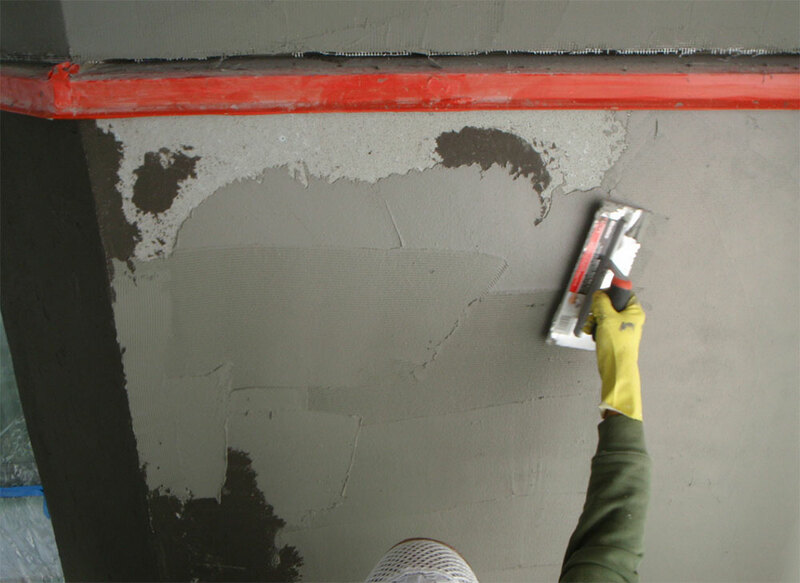 The membrane reduces the moisture exchanged between the cement board and thinset mortar and may result in reduced efflorescence; thus, it may also be referred to as an e lorescence mitigation membrane. Traditionally, this membrane may have been installed to protect the primary structure from moisture exposure. 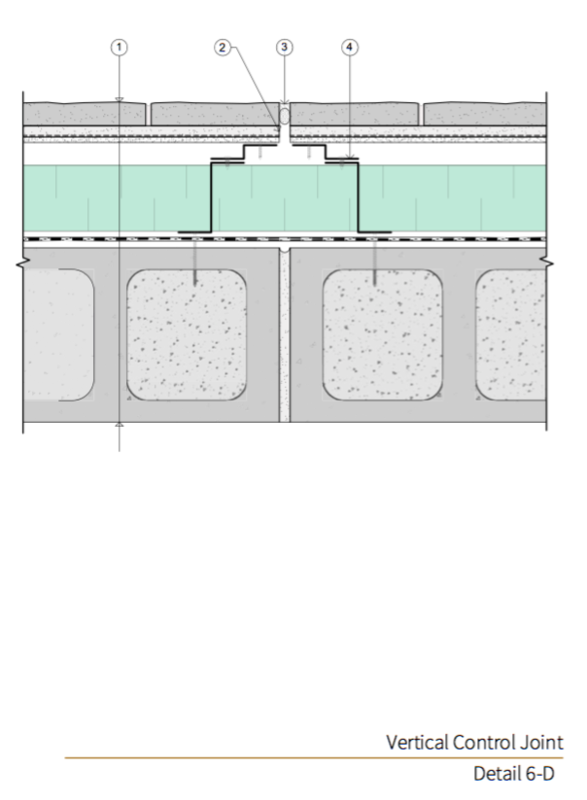 However, in this rainscreen system, the crack isolation membrane is not a replacement for the air and water control layers, which are located on the exterior face of the CMU wall. Fig. 6-13 Crack isolation membrane application over cement backer board. 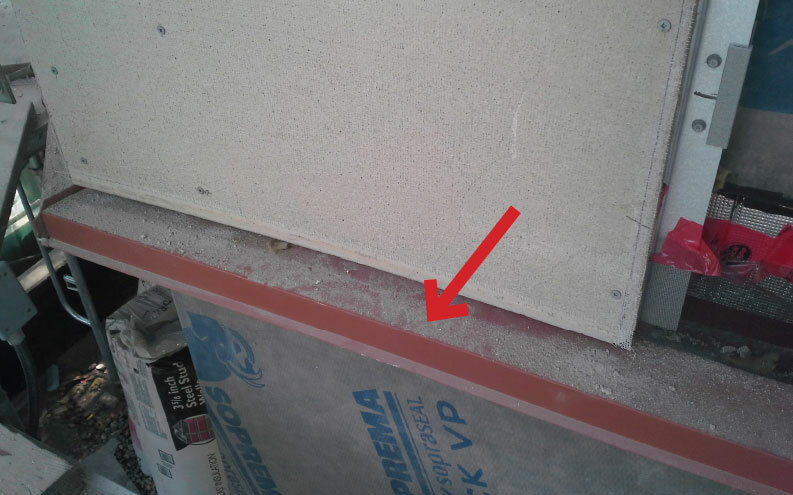 Cement board corners and fastener locations are treated prior to membrane application. A trowel-applied membrane is shown; membranes may also be fluid-applied. 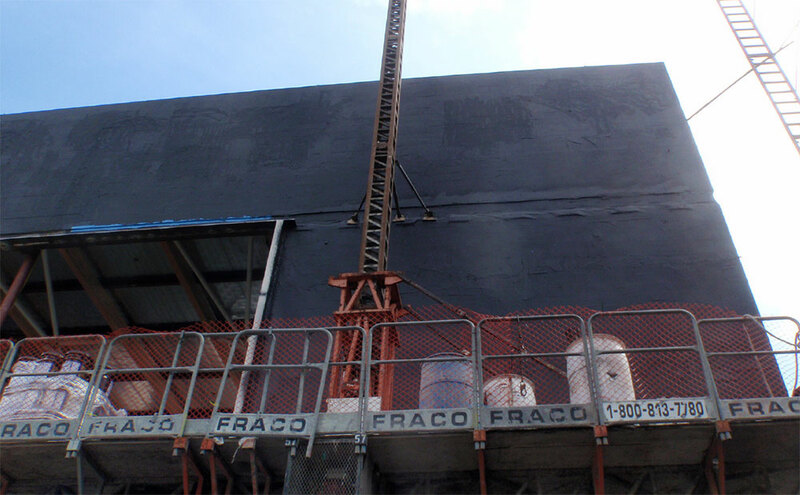 Appropriate product selection of masonry veneer unit and thinset mortar materials is necessary to provide a durable and water-resistive cladding system. The veneer units, thinset mortar, and joints should also be installed in conformance with industry standard best practices and manufacturer requirements and should comply with ASTM C1780.17 The specifics of architectural characteristics and structural properties of the veneer system, including mortar and cladding support systems, should be designed and reviewed by a qualified Designer of Record. Application of a clear water repellent to the adhered veneer of this system is common in the Northwest. Refer to the Surface-Applied Clear Water Repellents discussion on page i-59 for more information on selecting an appropriate clear water repellent and for best practice installation guidelines. Air and water control layer continuity is provided by the self-adhered sheet or fluid-applied air barrier and WRB field membrane, prestrip membrane, and air barrier sealant transition to the storefront window. The hemmed drip edge of the sheet-metal head flashing sheds water from the adhered masonry veneer above before it reaches the window and sill. The insect screen extends from the face of the air barrier and WRB membrane to the face of the vertical Z-girt to protect the cavity from insects and debris while still allowing for ventilation and drainage. 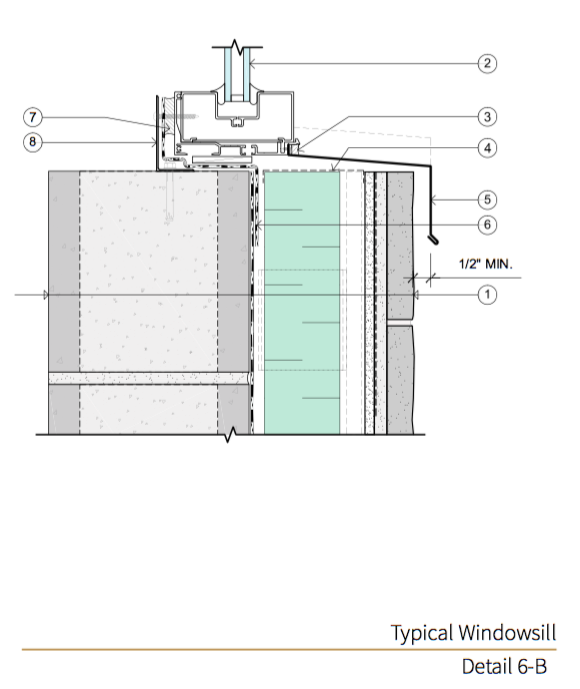 Continuous back dam angle at rough opening perimeter, minimum 1-inch tall, with window fastened through back dam angle per window manufacturer recommendations. The sheet-metal sill flashing sheds water from the window above and protects the rainscreen cavity. The hemmed drip of the sheet-metal flashing projects away from the cladding to promote watershed away from the masonry veneer face. Terminate the sheet-metal sill flashing with end dams at each jamb and counterflash each end dam with the sheet-metal jamb trim to close o the rainscreen cavity and complete the water-shedding surface. Sheet-metal jamb trim counterflashed over sill flashing end dams below. Attach trim to nearest vertical Z-girt as shown. Where needed, the exterior insulation should be supported with intermittent fasteners such as mechanically attached impaling pins. Consult with the air barrier and WRB membrane manufacturer for requirements on detailing these pin attachments through the membrane. The cement backer board is supported by continuous vertical furring on both sides of the control joint. The gap within the veneer at this location is free of all materials with the exception of a compressible backer rod and sealant to allow for movement while maintaining a continuous water- shedding surface. The sheet-metal parapet cap with hemmed drip edge is held o the adhered veneer face to minimize disruption of the air flow behind the veneer. A 1/2-inch gap is recommended. Insect screen around the insulation and vertical Z-girt cavity prevents insects and debris from entering the rainscreen cavity, while still allowing ventilation. 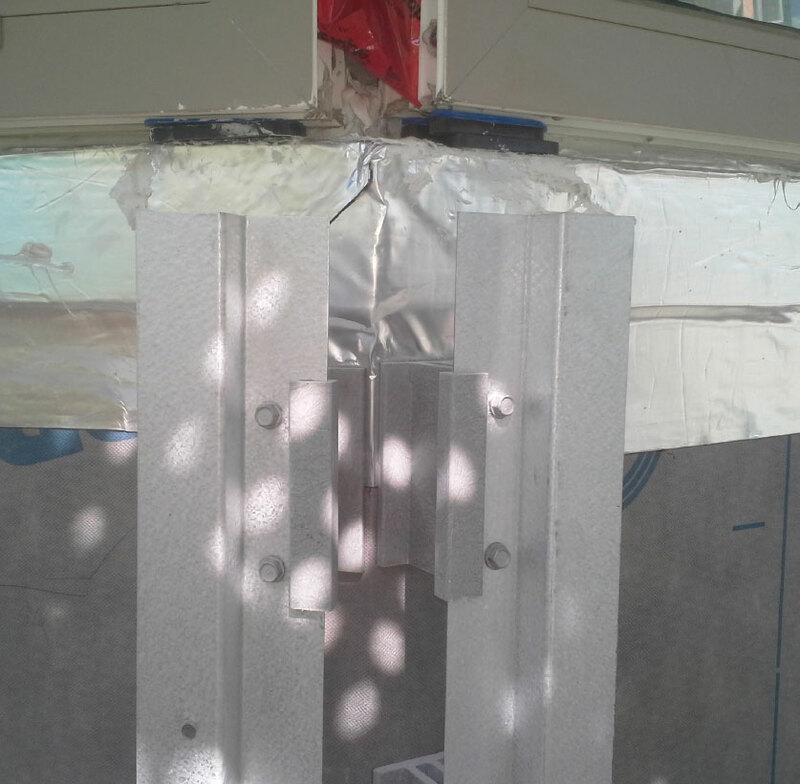 The sheet-metal flashing protects the underlying components from UV exposure. 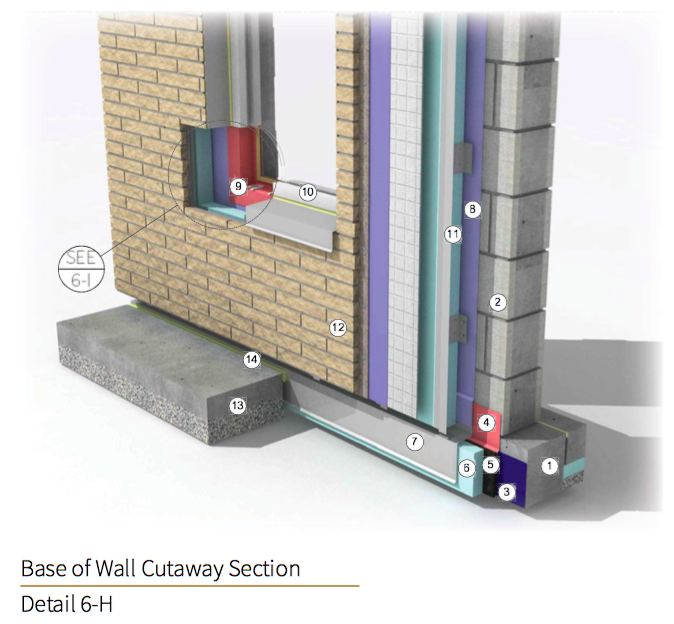 Insulating below the slab and exterior of the foundation wall is an alternative approach to the thermal break shown in Chapter 1, Detail 1-D.
As shown in Detail 6-F and Detail 6-G, exterior insulation fits between the intermittent cladding supports clips. When using rigid board insulation, the insulation may require notching around clips. Where needed, the exterior insulation should be supported with intermittent fasteners such as mechanically attached impaling pins. Impaling pins fasteners may need to be sealed where penetrating the air barrier and WRB membrane. End dams are formed at the ends of the sloped sheet-metal head flashing shown in Detail 6-F to direct water away from the rainscreen cavity and back to the exterior. Footnote (2) for compliance by exception. The ability to use this option depends on the jurisdiction, the building’s use, and the availability of CMU cores to be filled with insulation. If this exception is to be used, refer to the Thermal Performance and Energy Code Compliance discussion on page 4-5. For all energy code compliance strategies except the prescriptive insulation R-value method strategy, this wall system’s U-factor will need to be calculated or determined from tables; however, it may or may not be required to be less than the prescriptive U-factors in Table 6-2.
i-33 and Fig. i-26 on page i-39 of the introductory chapter describes the typical process of navigating energy code compliance options. Additionally, the thermal modeling results demonstrated in this chapter may be used to assist with selecting wall system components (e.g., cladding support clip type, insulation R-value/inch, etc.) to achieve a target U-factor. Also discussed are options for thermally optimizing this assembly, as determined through the modeling results. Cladding support clips, such as intermittent Z-girt or fiberglass standoff clips as shown in Fig. 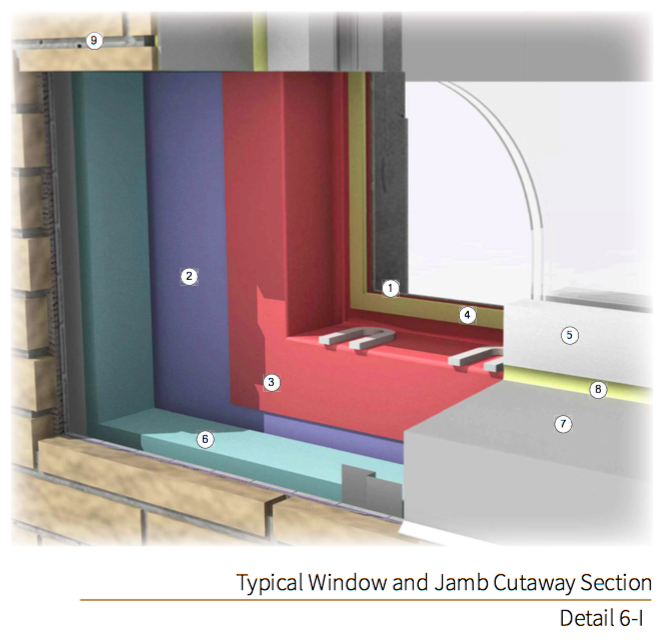 6-5, penetrate the exterior insulation in this system and create areas of thermal bridging (i.e., heat loss). An example of the thermal bridging caused by an intermittent Z-girt is described by Fig. 6-6 and Fig. 6-7 on page 6-8. 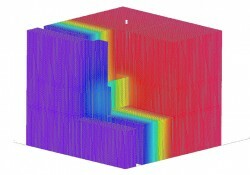 These figures demonstrate the geometry and the relative thermal gradient of this system when thermally modeled. The lighter blue thermal gradient color at the exterior face of the Z-grit describes a warmer temperature than the adjacent darker blue insulation face—an indicator of heat loss at the penetration through the thermal insulation. This thermal bridging reduces the system’s effective thermal performance. Three-dimensional thermal modeling demonstrates this system’s effective thermal performance with various insulation thicknesses, insulation R-values, and cladding support clips/materials. A discussion on the modeling performed for this guide is included in the appendix. – Intermittent Z-girts (16-gauge) made of either stainless steel or galvanized steel. Clips are 6-inches tall and spaced at 24-inches on-center vertically, 16-inches on-center horizontally. – Fiberglass standoff clips spaced at 24-inches on-center vertically and 16-inches on-center horizontally. Both stainless steel and galvanized steel fasteners are considered for the fiberglass standoff clip option. ExteriorInsulation:R-4.2/inch or R-6/inch insulation product in thicknesses of 3-, 4-, and 5-inches. The R-values selected demonstrate the lower and upper thermal resistance of typical exterior insulation products. Modeling results shown in Table 6-1, Fig. 6-8, and Fig. 6-9 (see page 6-10 and page 6-11) demonstrate the system’s effective R-value under various conditions; Fig. 6-8, and Fig. 6-9 graphically represent the results summarized in Table 6-1. Below is a discussion of the results. Where reductions in the system’s effective R-value are discussed, these values are as compared to the system’s effective R-value “Without Clips”. As determined from Table 6-1, fiberglass standoff clips reduce the system’s effective R-value by 11 to 32%, while intermittent Z-girts reduce the system’s effective R-value by 21 to 53%. This system has a greater effective R-value when low-conductivity clip supports (such as fiberglass clips) are used in lieu of intermittent metal Z-girts. Thermally improved cladding attachment options can achieve better effective thermal performance values; a number of systems are commercially available and new products continue to be developed. Most manufacturers of proprietary clip systems will have thermal modeling results available when determining the system’s effective thermal performance value. When considering fiberglass standoff clips, the results of Table 6-1, Fig. 6-8, and Fig. 6-9 demonstrate that the system’s effective R-value is reduced by 11 to 19% for stainless-steel fasteners and by 20 to 32% for galvanized-steel fasteners. Better system thermal performance can be achieved with fiberglass standoff clips when stainless-steel fasteners are used in lieu of galvanized fasteners. As determined from Table 6-1, intermittent stainless-steel Z-girts reduce the system’s effective R-value by 21 to 32%. Galvanized-steel intermittent Z-girts reduce the effective R-value by 35 to 53%. Greater system effective R-values are achieved with stainless-steel intermittent Z-girts, as opposed to galvanized- steel Z-girts. Galvanized steel has a greater thermal conductivity than stainless steel. The system’s effective R-value is similar for both fiberglass standoff clips with galvanized-steel fasteners and stainless-steel intermittent Z-girts as shown in Table 6-1, Fig. 6-8, and Fig. 6-9. Some performance targets can be met without proprietary cladding attachment systems. This consideration may prove to be a cost-effective solution. 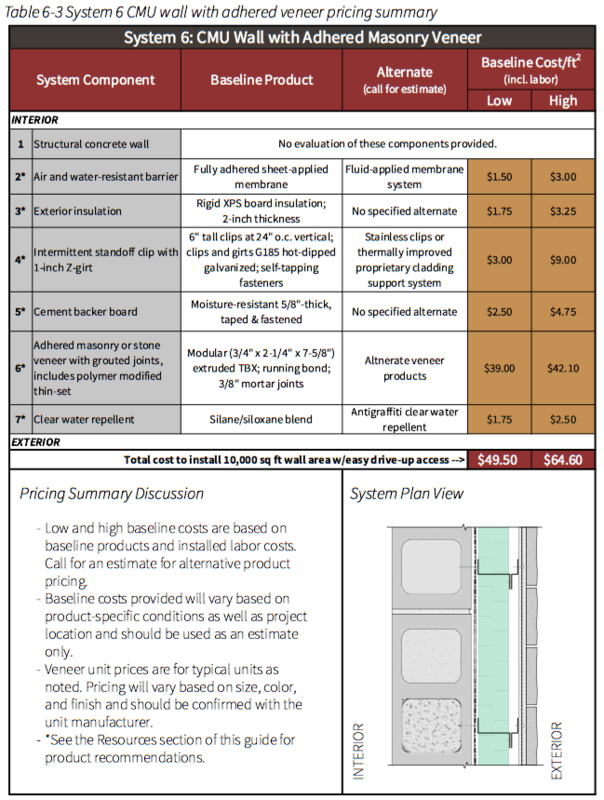 A pricing summary for this system is provided in Table 6-3 on page 6-21. Pricing demonstrates the relative price per square foot and is based on a 10,000-square- foot wall area with easy drive-up access. Pricing includes all components outboard of the CMU wall structure and provides no evaluation for interior finishes or CMU wall structure. Pricing is valid for the 2018 calendar year. Current pricing is also available at www.masonrysystemsguide.com.